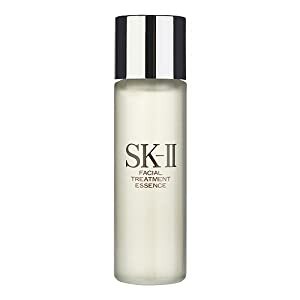 I first heard about skincare products incorporating beneficial bacteria derived from yeast during the fermentation process when SKII first came out with their Facial Treatment Essence many years ago. Recently in the past 2-3 years, there have been new fermented essences on the market that are based off of SKII's famous Facial Treatment Essence, and at affordable prices! To see these great options and the benefits of incorporating fermented essences into your skincare, click through the jump! The process of fermentation breaks down beneficial bacteria from yeast (or other food such as beans or rice) into finer molecules which are then more readily & easily absorbed into the skin. Subsequently, the importance of the fermentation process in relation to skincare, is that the result is a product that is more effectively absorbed into the skin compared to non-fermented cosmetic counterparts. Just to be clear however, the entire product isn't fermented! Only the beneficial bacteria that is created by the fermentation process has actually gone through the fermentation process. Usually, the products are called "essences" that are clear in color and essentially feel like water on the skin. 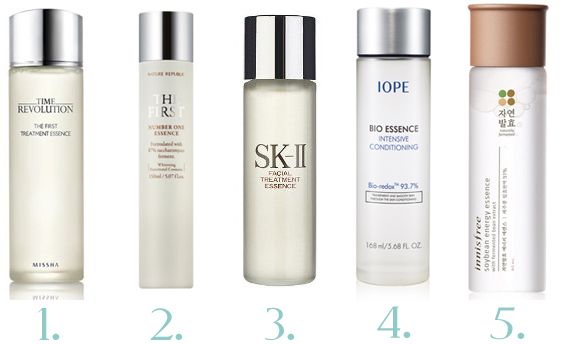 They're meant to be the first or second skincare step in your regime, and can be applied twice a day or nightly. Just like how the bacteria in yogurt is beneficial for our body's intestines & digestive system, the bacteria in these essences specifically benefit our skin. Although the bacteria in each essence may differ, each bacteria in each essence encourages cell turnover, promotes radiant, glowing, and smoother skin, while also helping to control excess sebum. Qualities that we would probably all love to see in our skin right? You can totally afford to incorporate a fermented essence no matter what your budget is. SKII was the original fermented essence, but it starts out at at least $100 per bottle. If you don't want to invest that heavily just yet in a fermented essence, the essences from Missha (#1), Nature Republic (#2) and Innisfree (#5) are all under $40 per bottle. IOPE (#4) is in the middle ranging at around $50-70 per bottle depending on the size you get. I personally have already purchased and have been using Nature Republic's the First Essence. If you're curious to find out how it has benefited my skin and whether the essence has lived up to its claims, look out for the post in the near future!